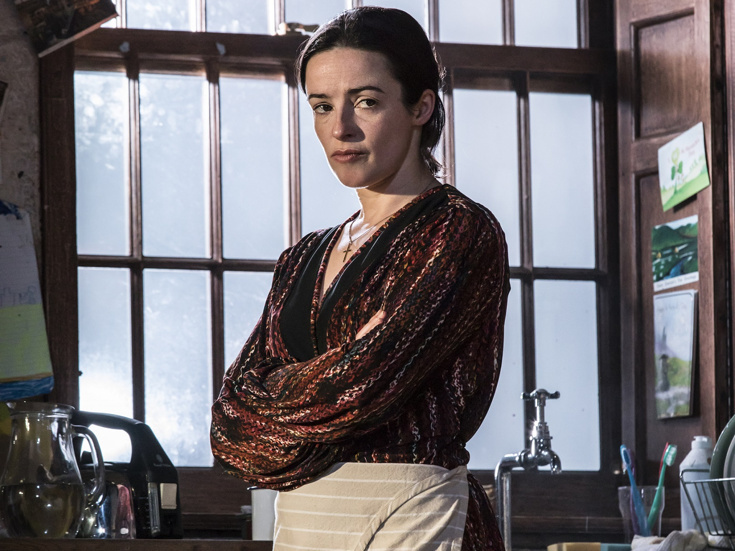 Laura Donnelly in the London staging of "The Ferryman"
Additional casting is set for The Ferryman, an Olivier-winning play by Jez Butterworth arriving on Broadway this fall. Directed by Olivier winner Sam Mendes, the previously announced production will begin previews on October 2 at the Bernard B. Jacobs Theatre with an opening scheduled for October 21. New to the 30+ member cast are Dean Ashton, Glynis Bell, Gina Costigan, Charles Dale, Justin Edwards, Fra Fee, Fionnula Flanagan, Tom Glynn-Carney, Stuart Graham, Mark Lambert, Carla Langley, Conor MacNeill, Colin McPhillamy, Rob Malone, Dearbhla Molloy, Glenn Speers, Niall Wright, Audrey Bennett, Peter Bradbury, Trevor Harrison Braun, Will Coombs, Carly Gold, Holly Gould, Matilda Lawler, Michael McArthur, Bella May Mordus, Griffin Osbourne and Brooklyn Shuck. They join previously announced London cast members Paddy Considine in his stage debut as Quinn Carney, Laura Donnelly as Caitlin Carney and Genevieve O’Reilly as Mary Carney. Four babies, who join the cast to rotate in the role of Bobby Carney, will be announced at a later date. The Ferryman takes place in the early '80s in Northern Ireland, where the Carney farmhouse is prepping for the annual harvest and a celebratory feast. This year, however, the festivities are halted by an unexpected visitor. The Ferryman will feature scenic and costume design by Rob Howell, lighting design by Peter Mumford and original music and sound design by Nick Powell.